The entire tower has been upgraded and expanded. Though I’ve made it more lush, I made sure to retain the tower’s Telvanni flavor. 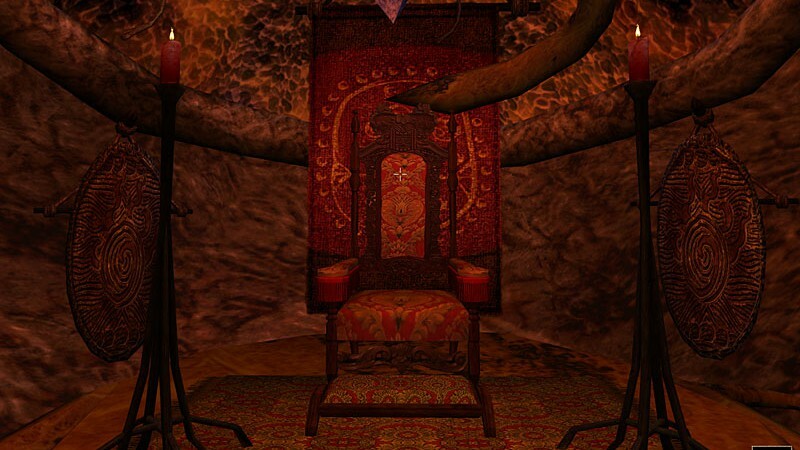 Unique tapestries have been made for this mod, sporting the Telvanni symbol with three distinct color schemes to match different areas of the tower. Living quarters are donned in earth tones and dark blue, reception areas are donned in green and gold, and areas meant to display your power are donned in red and gold. The tower’s main areas remain the lower tower, upper tower, and dungeon. In the lower tower you’ll find entrances to the storage room, servants quarters, and tower bath. In the upper tower you’ll find an alchemy garden and secret lab, as well as two additional turrets: one being a comfortable guest chamber, the other your throne room. The dungeon has also been expanded, leading to the deep tunnels and the vault, which offer new exploration opportunities as you complete quests. The vault is a separate build, available after you’ve completed your tower and become Archmagister. Talk to Llunela Hleran about your stronghold, and she’ll offer to begin vault construction once its requirements are in place. This build also makes the throne room available. Version 3 upgrades the look of the entire tower. Every rug, tapestry, cushion, bed, and chest has been replaced with my own high-res versions. The chests and cushions can also be picked up, positioned, and rotated. Also, there’s a lot more storage in this version: chests and display cases galore. Even the lower tower has more storage to help you move in before your tower is expanded.